I thought it was fate. It had to be, right? While waiting in the lobby of a Wabash connection’s office after work, I picked up an issue of the Indianapolis Star sitting on the coffee table. I almost routinely picked up the sports section, but I snapped out of it and grabbed the Culture section instead. In the corner was a competition for an arts & innovation idea involving art and technology in Indianapolis and a $10,000 grand prize. Why not, right? So I gathered a few friends in various technology areas (web, programming, and engineering) and we brainstormed for a bit. I can’t say it was as good as a Leo Burnett ‘Farmhouse’ session, but Burnett was right in that it’s best to join great minds from various disciplines to tackle a problem. Now I’m not saying our team had great minds by any means, but I feel we came up with a pretty unique solution that one of us couldn’t have come up with on our own. 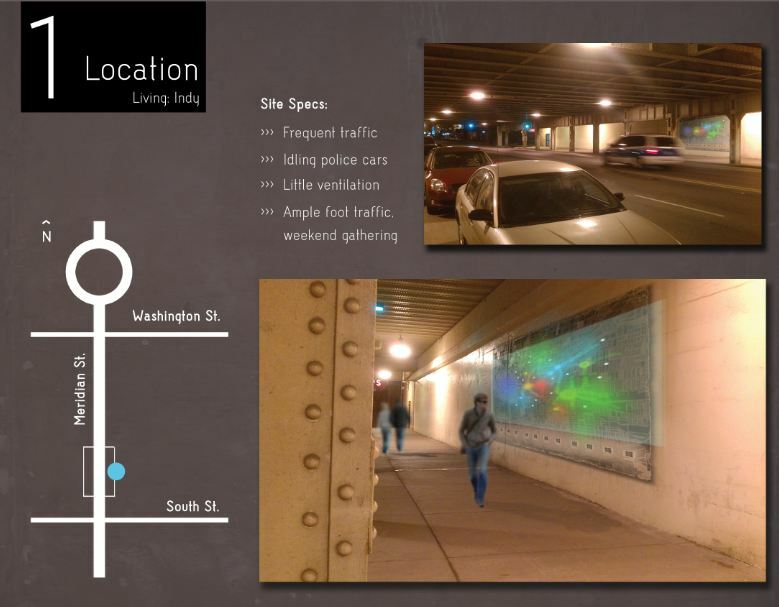 Basically, the idea was to use air-cleansing paint to create a mural and combine it with current social and Bluetooth signals to show the real-time activity of Indianapolis in an interpretive way. Did we make the top 5? Not in the judges’ book. I like to think we placed 6th of 50. Read below for our submission, and click here to view the final five. The event takes place February 8th at 7pm, and I look forward to the learning opportunity. And to celebrating some other pretty fascinating ideas. The project may fit a future contest later in the year, so stay tuned for that submission… Enjoy. 3. instill a sense of pride. The idea started with KNOxOUT catalytic paint. When John said a square meter of this stuff reacts with nitrus oxide in car exhaust to form as much harmless nitrogen as one mature tree, the light bulb turned on (huffintonpost.com, theriskexchange.wordpress.com). This paint seemed perfect for a mural in a tight, treeless space like underneath the bridge on Meridian & South St. where foot traffic is high and car exhaust exudes from passing vehicles and idling police cars. Essentially, the paint helps the tunnel last longer and look better as it cleans the air for passing and gathering people. For site study, see Image 1. The mural itself should feel familiar, but more than a map. It should feel like a living being. Painted directly onto concrete, the mural will portray Indy with soft lines and shapes as seen in Image 2. Offset a few inches from the concrete rests translucent plexi-glass panels coated in clear catalytic paint (idealab.talkingpointsmemo.com). In image 1, you’ll also see that digital LED strip lighting attaches behind the light-diffusing plexi-glass and follows the map’s streets. 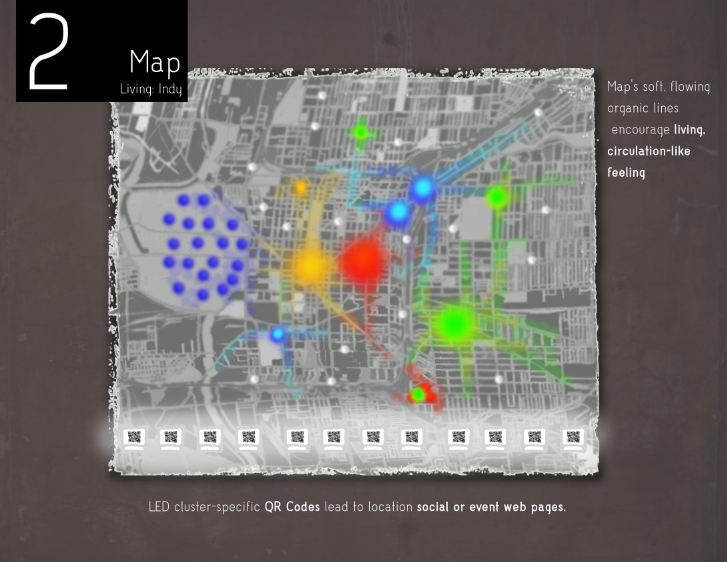 Meanwhile, LED clusters mark lively spots like arts buildings, restaurants & bars, theaters, hubs of public activity, etc. 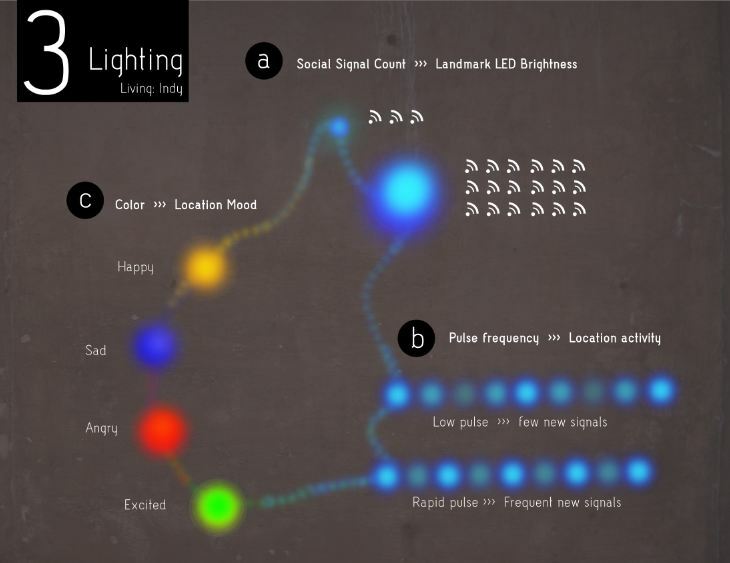 To make the mural come alive, the lights sync with social data from Twitter’s API or by using BlueTooth presence detection. Either data source gives geographic coordinates to smartphone signals that we use to determine population, population change, and current mood of an actual landmark in the city. Paired with digital programming, these qualities are indicated as such in Image 3. Thus, you could have seen an instance like a thrilled or upset fans during this year’s downtown IU vs Butler game during which LED strips circulate that energy to Mass Ave. All while sad IUPUI students study away. (Image 2). Additionally, we can tag landmark LEDs with a number and index them with their location information and a scanable QR Code that leads a smartphone user to the landmark’s current events webpage or Twitter feed (Image 1,2). In the end, a passerby sees Indy as the always-beating place that it is while learning current city happenings. With air-cleansing, concrete-protecting paint, organic design, and real time socially responsive lighting, we hope to surprise visitors and instill the notion that the people are a part of Indy as much as Indy a part of its people. India-No-Place no more. 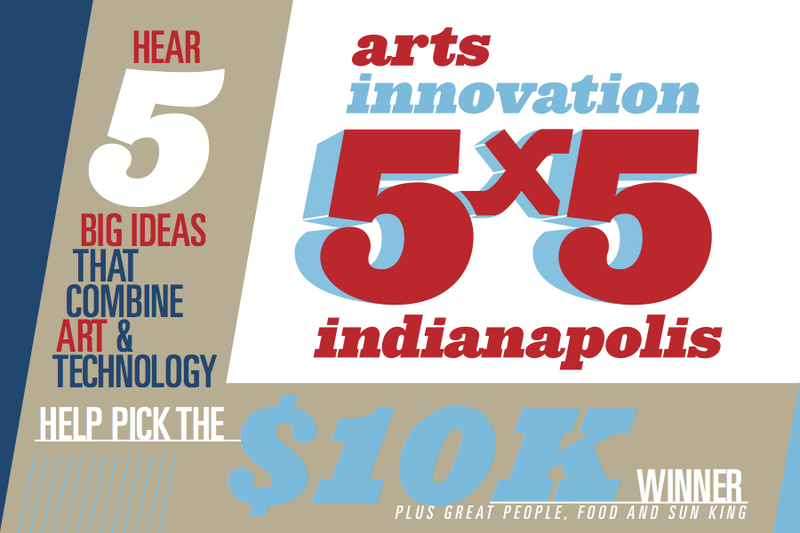 We’re putting Indy on the map for good. That’s pretty awesome. Sorry to hear you guys didn’t make the top 5, but that’s still a really cool idea worth holding onto. Thanks Jay. Gotta hold on to it. Hope to see you at their big presentation event.